Because professional athletes exercise for a living, you might assume that they have healthier hearts than the rest of us. But that's not necessarily the case, at least among retired National Football League linemen. 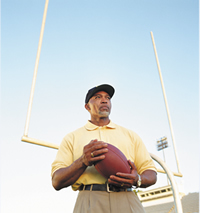 Those former players—who played tackle, guard, center, or defensive end positions—have a higher risk of dying of cardiovascular disease compared with the general population, according to a study in the November American Journal of Cardiology. Linemen are also more likely to have calcifications in their arteries (an early warning of future heart disease) than non-linemen, the study showed. Non-linemen included all other positions, such as running backs, wide receivers, tight ends, and others.